Christmas Carousel | Standard Figurines | One Price Low Flat Shipping! 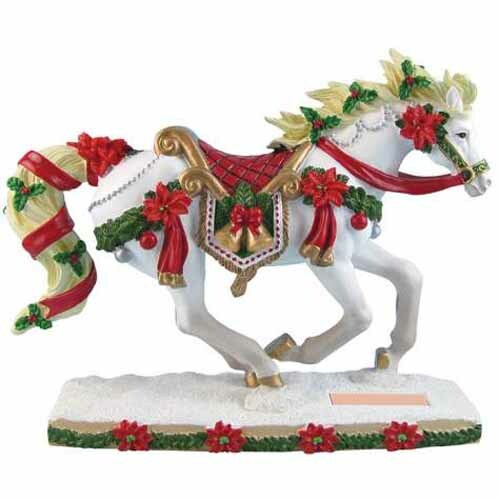 From Westland Giftware's Horse of a Different Color 2015 Holiday Collection, Christmas Carousel Quarter Horse figurine. Made of hand-painted resin. Measures 6" tall. A metal plaque is embedded in the base, showing the title and the exact serial number (out of 10,000). This snow white quarter horse holiday figurine is cast in a running pose and is decorated with festive green holly leaves woven throughout its mane and tail. There are also holiday bulbs and vibrant red bows adding to this horse's seasonal cheer!